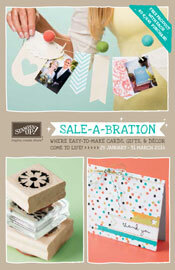 Just a little reminder that Sale-a-Bration ends on 31st March. For every £45 you spend, you can select a free item from the Sale-a-Bration catalogue. Don’t miss the opportunity of getting something FREE. Click the link on the left to go shopping, or if you prefer contact me and I can place the order for you. As always, I am around to answer any questions you might have.